IFA President Joe Healy and 3-year-old Lauren O’Callaghan, St Joseph’s Maryland, at opening of live crib and winter wonderland. Picture: Finbarr O’Rourke. 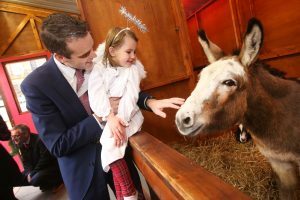 A gift from the country to the city, the Live Animal Crib, has been opened in Dublin alongside a new Christmas Winter Wonderland. “The Crib reminds us of the simplicity of the Christmas message and represents a small piece of the countryside in the heart of Dublin’s vibrant bustling streets,” said Brendan Carr, Lord Mayor of Dublin at the opening at the Mansion House, Dublin on Tuesday 6 December 2016. He thanked the Irish Farmers’ Association (IFA) for the gift of the animals and their care throughout their stay at the Live Animal Crib. 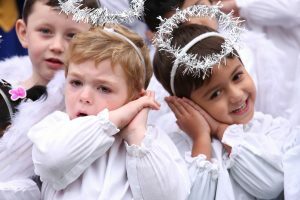 He encouraged all Dubliners to visit the Crib in its new Christmas Winter Wonderland setting on Dawson Street, which he hopes will revitalise the 20-year-old tradition. Alfie Windum and Aitan Bass from St Joseph’s Maryland belt out the Christmas carols at the opening. Picture: Finbarr O’Rourke. The Crib and Winter Wonderland are free to all, and donations go to Dublin’s oldest charity, the Mansion House Fuel Fund. Organisations which have benefitted from this fund in recent years include: St Vincent de Paul, Dublin Simon and Abbey Presbyterian Church Hamper Fund. This is his first year to attend the official opening and he highlighted how city children can enjoy visiting and patting the live animals and experiencing for the first time something like touching a sheep’s woolly coat. The animals are brought each morning and returned to an Enniskerry farm each evening. The farmer, who has provided animals for 20 years, said he loves seeing the joy on visitors’ faces when they encounter animals such as the donkey and goat, which are constantly interacting with each other. The Crib has been a joint venture between Dublin City Council and the IFA since 1995. The life-size stable building is constructed by Dublin City Council’s Housing Maintenance Section. This year Lord Mayor Brendan Carr has introduced a Winter Wonderland for children to walk through on their way to the Crib. They can interact with Santa’s sleigh, his reindeer, giant presents and baubles, and enjoy Christmas on Dawson Street. The Crib is open from Tuesday 6 December until Christmas Eve from 11 am to 5 pm daily (Christmas Eve 11 am to 1 pm).